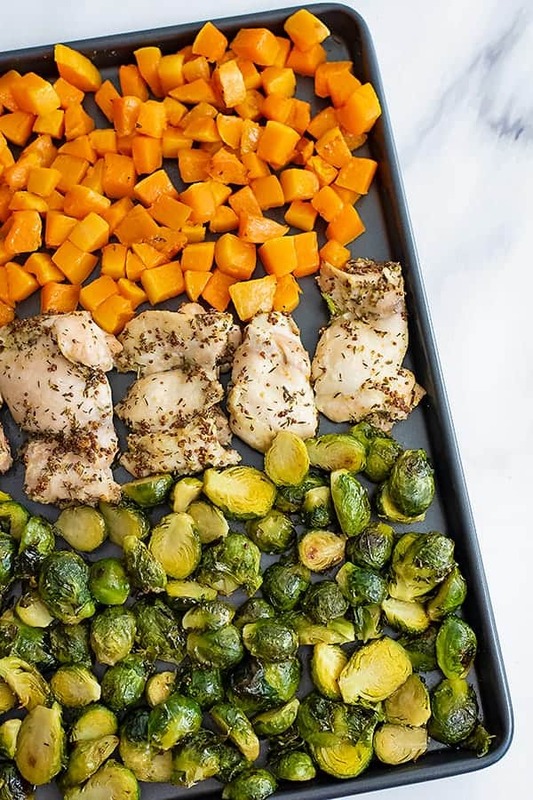 Sheet pan dijon mustard chicken thighs and vegetables is the perfect weeknight meal! 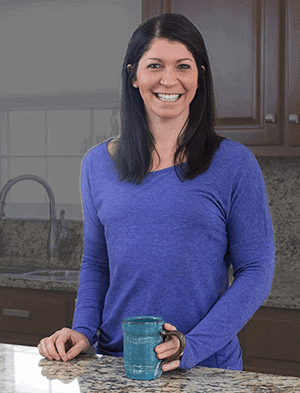 Simple to make, this healthy recipe is full of flavor and is ready in about 30 minutes! 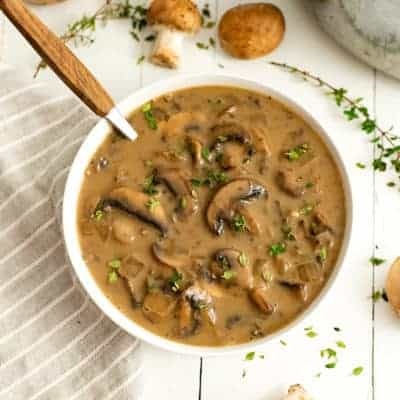 Gluten free, paleo and Whole30 this recipe can easily be made low carb as well! 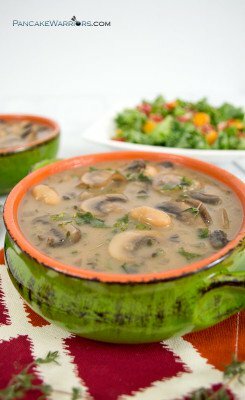 It is my goal to get dinner on the table as quickly as possible without having to do a ton of dishes! After testing recipes and working all day, the last thing I want to do is spend my night doing dishes! That is why I love sheet pan meals! 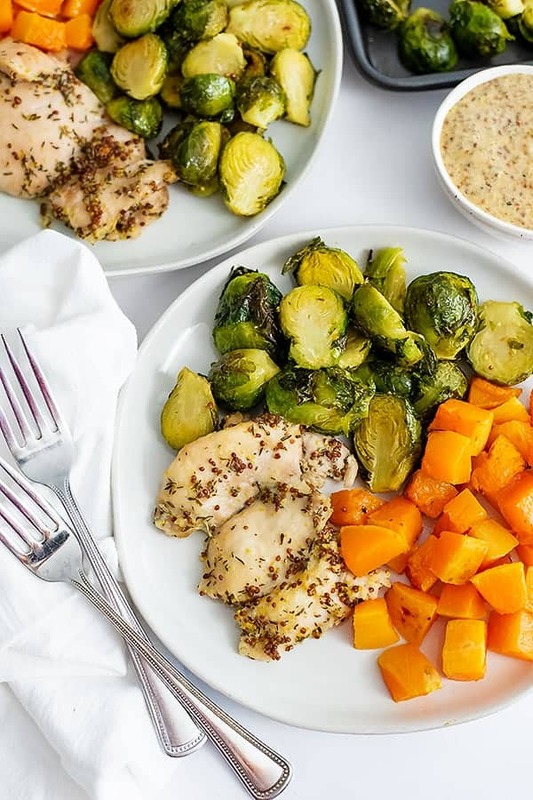 This recipe for sheet pan dijon mustard chicken thighs and vegetables combines some of my favorite flavors together – dijon mustard and brussel sprouts! 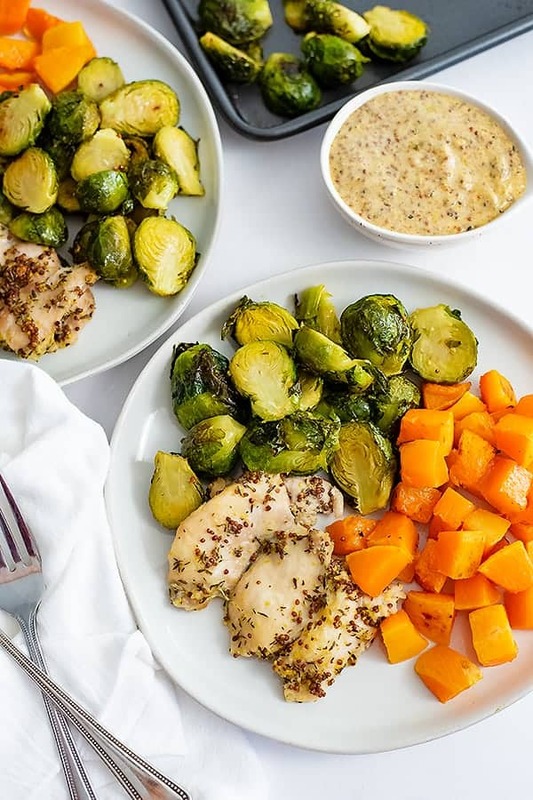 If you haven’t had that combo together, check out this garlic dijon sauce you could make with these brussel sprouts to take this simple meal to the next level! 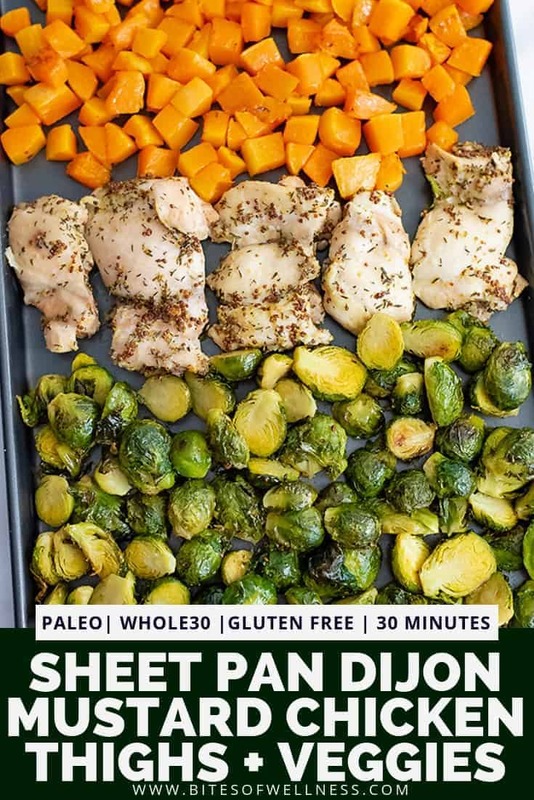 In order for everything to have room to cook on the sheet pan, I recommend you either make this on two separate sheet pans or invest in a half sheet pan (which will fit in most ovens)(affiliate). 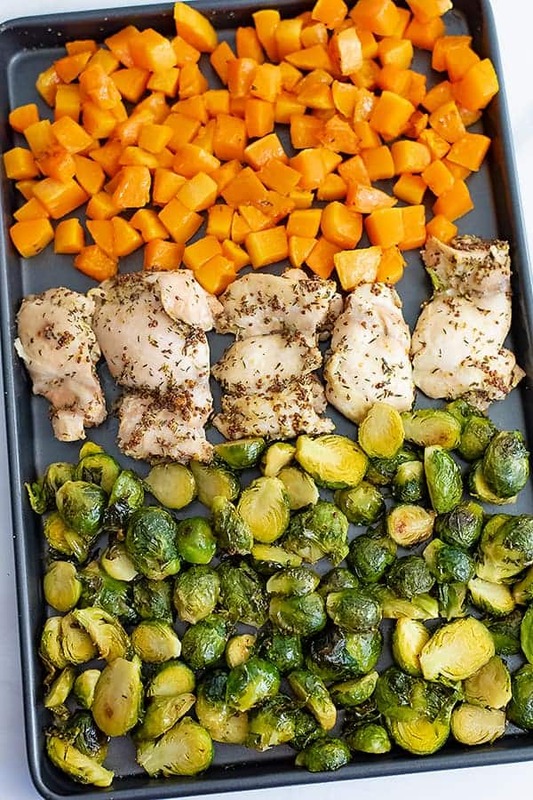 If you use a half sheet pan, start the pan with just the butternut squash, then add the chicken and brussel sprouts after roasting for about 10 minutes. Everything should be done at the same time! The butternut squash will take slightly longer to cook than the brussel sprouts and chicken thighs so if you are making this on two separate sheet pans, the butternut squash will go on it’s own pan and will cook for about 10 minutes before adding the brussel sprouts and dijon mustard chicken thighs. While the butternut squash is roasting, cut the brussel sprouts in half (or quarters if they are really large). Add the brussel sprouts to one side of a baking sheet and leave the other side for the chicken thighs. Make the marinade for the dijon mustard chicken thighs and coat the boneless skinless chicken thighs well. Add the chicken thighs to the pan with the brussel sprouts. 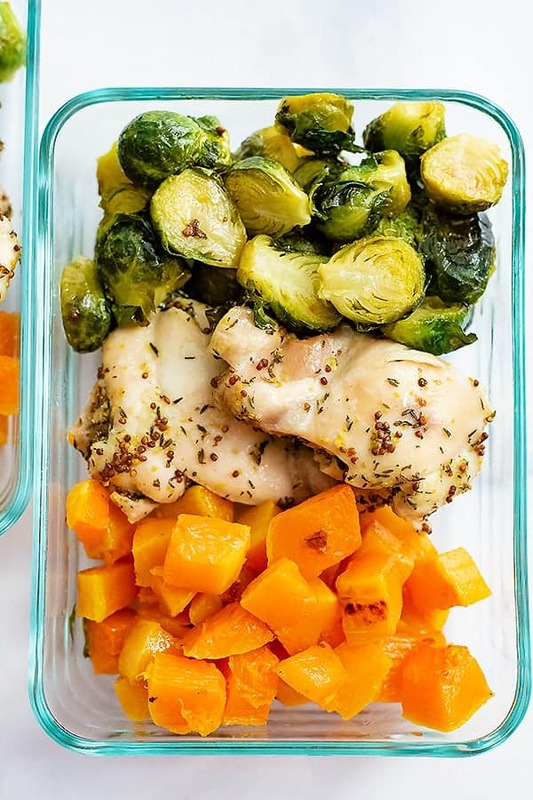 Cook the chicken and brussel sprouts in the oven with the butternut squash for about 18 minutes. After 18 minutes, check the internal temperature of the chicken. If it’s reached 165F, take the chicken thighs off the baking sheet and give the brussel sprouts 3-4 minutes to cook without the chicken to allow any excess liquid from the chicken thighs to cook off. This recipe for dijon mustard sheet pan chicken uses boneless skinless chicken thighs because the chicken thighs are much more forgiving in the oven. Chicken thighs don’t dry out as quickly and don’t get as stringy if they are overcooked. Yes you can use chicken breast instead of chicken thighs in this recipe. However, it’s important that you butterfly the chicken breast so that it will cook in adequate time. You can also cut the chicken breast into strips so that it will cook quickly (15-18 minutes in a 450F oven). One tip to keep the chicken breast from drying out is to cover the chicken with foil for at least part of the cooking. Because you are cooking everything on a sheet pan, using parchment paper to line the sheet pan makes for a simple clean up. If you don’t have parchment paper you could also use aluminum foil or silicone pan liners. Roasted chicken is good for about 3 days in the fridge in a sealed container. The vegetables will last about 5 days in the fridge in a sealed container. 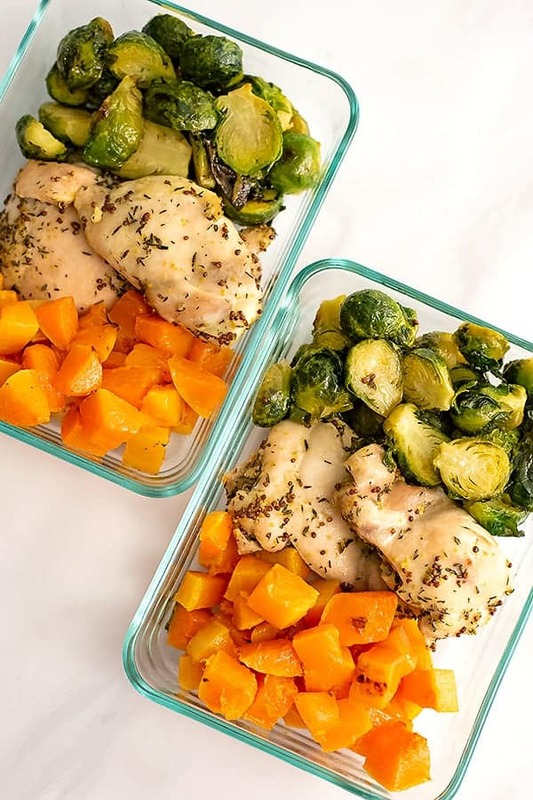 If you are going to make this sheet pan dijon mustard chicken thighs and vegetables recipe for meal prep, I recommend these glass containers for easy storage! If you need the chicken to last longer, you can freeze the cooked chicken thighs in individual portions in a zip lock bag with all the air removed. Just defrost and reheat as you normally would. If you love sheet pan dinners as much as I do, you’ll love how quickly this dijon mustard chicken thigh recipe comes together. Check out the video below and if you have any questions make sure to let me know in the comments. Add parchment paper to a baking sheet and spray with non-stick spray. Add butternut squash and bake in the oven at 450F for about 30 minutes. While butternut squash is baking, cut the brussel sprouts in half lengthwise (or quarters if very large). Add parchment paper to another baking sheet and spray with non-stick spray. Place the chopped brussel sprouts on 1/2 of the second baking sheet. Add the chicken to the other side of the baking sheet with the brussel sprouts and place in oven with butternut squash. Cook for 18 minutes. After 18 minutes, take the chicken and brussels out of the oven and check the temperature on the chicken. If the chicken has reached 165F, you can remove the chicken from the pan. Add 1/2 tbsp garlic olive oil and 1/2 tsp salt to the brussel sprouts and place them back in the oven for 3-4 minutes. After 3-4 minutes, remove the brussel sprouts and the butternut squash.